As an artist and Mum, I feel very strongly about the presence of art in schools; I also know the reaction I get when painting in schools from students, staff and parents alike. It is a very special experience and I have had children come up to me years later, still excited about their involvement in a mural project. 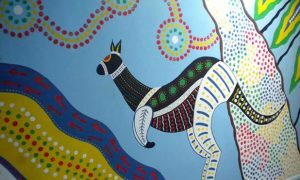 This mural was designed for kangaroo class in a Catholic Primary School. Wall murals are an ideal way to decorate a dull empty wall space and, as they are relatively cheap and long lasting, they are a practical and . Despite their name, they don’t have to be on walls – they’re also an ideal way to improve the look of wooden fencing, playground floors and mobile classrooms. Creating murals is fun for all concerned and can involve anyone, from just one or two pupils right up to the entire school. This large collaborative project incorporated the work of 13 students. We receice a large amount of feedback from schools and from parents regarding murals, which I have collated here. I have also included some information from Ofsted themselves, based on what they see in schools. The fact is that the vast majority of Charlotte Designs’ school clients receive an ‘Outstanding’ from Ofsted. Now whilst that can’t be just because they have had murals painted, it does show a clear link between schools who place importance on their environment and the standard of learning achieved. It is also a fact that over 90% of my school clients ask me back to do further work, one mural it seems, isn’t always enough! So why are murals so good fro schools? Murals contribute hugely to the school buildings and grounds providing an aesthetically stimulating environment for learning, as well as a useful resource for teachers. Value is seen in the juxtaposition of frequently changed displays of student’s work next to high quality work by experienced practitioners. Working with experienced artists and practitioners provides links with the local community and experience of working on a collaborative project. Exposure to high quality works of art encourages students to formulate their individual responses to art. Exploring their feelings and discussing their emotions, not just creating works of their own. 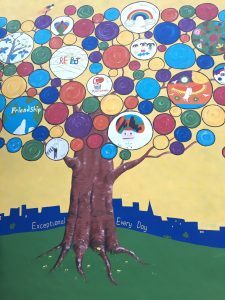 Murals can be effective at delivering key messages (such as the importance of exercising, healthy eating and safety messages) in a creative and inclusive way. Murals are particularly effective in communicating with those children with learning issues. At Charlotte Designs we aim to work with school staff to brighten up the environment for students and staff alike. Each school’s requirements are different and the space they have unique to them. We believe that we can help all of our clients to achieve their goals and provide a long lasting and valued resource for learning. What an interesting article, the link between schools which care about their environment and academic success seems obvious when you point it out. 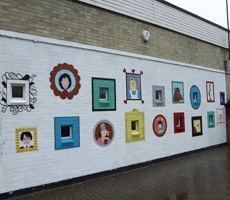 Great murals – would be great to improve many a dull corridor in a school or hospital!